I hope you weren’t worried. The internet at the hotel last night was pretty temperamental and I just couldn’t get on. 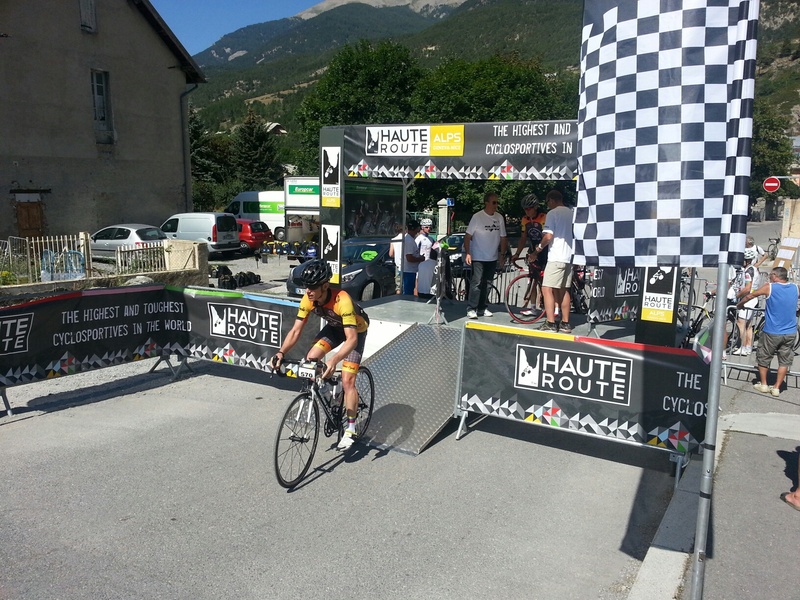 Today’s stage was quite simple for the athletes (probably a nightmare for the organizers); we did a 23 km time trial up the Cime de la Bonette, the highest through road in Europe. In many ways, the climb is reminiscent of Mont Ventoux, but with 2 more km added to the fun. The elevation gain was nearly 1600 meters. The riders started in blocks of 75, with 5 min breaks into between, I think. Rob, myself and Mark were all in the 2nd to last block, since we we were somewhere in between 76 and 150 in the GC. Mark was kind enough to snap me starting. I’d done one mountain TT before, but it was local and just a mass start. This was quite cool and we even had the guy who counts down the last five seconds with his fingers. Very pro! After crossing the timing mat I quickly got up to a heart rate I thought I could hold for the next 1:30 to 1:45 minutes. Or at least I thought I did. See, the battery on my Polar has been dead or dying since Day Two and I only had ‘time’ on the machine (I have nothing now). Luckily I’ve been paying attention to my personal pain this year and I rode the entire TT on the speed of my respiration and ‘perceived effort’, i.e. the amount of pain I was experiencing. 20 seconds behind me was Rob, breathing down my neck. I tried not to think about those coming up from behind (those who were ahead of me in the standings) and just focused on reeling in anybody I saw in front. I passed a few and got passed by others, including Rob, somewhere after the halfway point. The last km of the time trial was an evil ramp of over 10% and I struggled up that pretty slowly. I’m really missing my 12-27 now! But I finished, and in a good time of 1:36. The elation at the top was electric. Everyone up there seemed to be ecstatic about their performance. 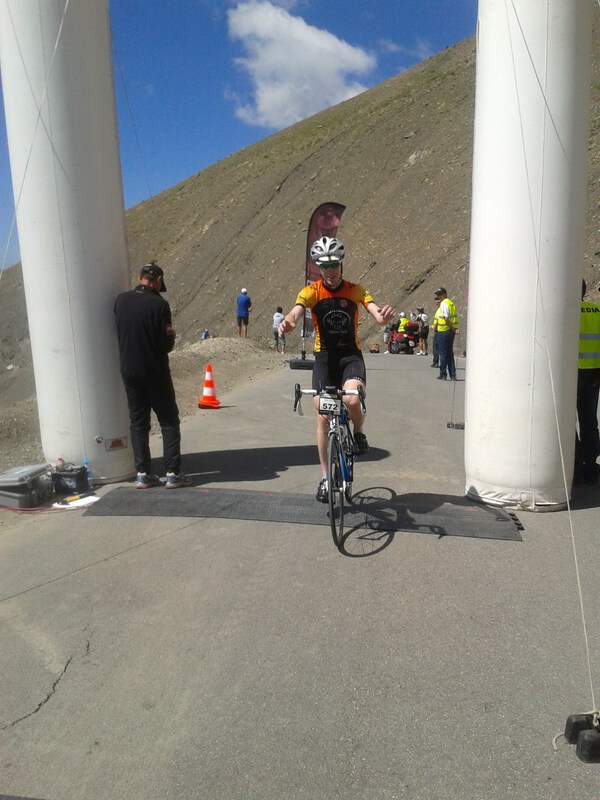 As for me, it was probably the hardest 1:36 I’ve ever spent on the bike, so I couldn’t but not be pleased. My amazement at the strength of the riders in this race continues. The times above, although pretty decent, actually brought us all down a few spots in the overall classification, as well as the team. Still, all three of us destroyed ourselves on that mountain, so there’s not much more we could have hoped for. Here’s our Irish ringer, Mark, just before he collapsed under the Europcar truck. Day Six coming…at some point! Thanks, Fizz. I am, too. I can’t believe how fast everyone crushed that mountain. Respect to all in the team! Amazing job guys, as fizzhog says, I am too, in awe! Me, I’m with the above …this effort is unimaginably-for-me-who-isn’t-doing-it, wildly, amazingly, extraordinarily, fantastically difficult and you are crushing it, riding impeccably! Super! In both languages, super! And finding the wherewithal to keep thisblog going! Just read the final results… as good as all the rest… BRAVO TEAM !!!! you have conquered the hardest off all non professional races….and made it look easy …. Can’t say enough about how hard you trained and how well you did….Enjoy a well deserved break….and training starts next week for next years race….LOL…. You’ve hit it on the head, except the ‘easy’ part! I am sure I had the look of death warmed over most of the week. I can’t imagine how badly I would have suffered without all that training, though. I shudder just thinking about it. I’ve never tried this function (reblog) on WordPress, so hopefully it works. I’ve been talking to a client about the effort needed to get one’s self up Ventoux (he’s a triathlete, so we are geeking out on FTP talk), which made me think about how to explain something like this to someone. Then last night, over a nice talk with my step-brother, Rob, the subject of the article I’m re-blogging came up – namely, the hardest 1:36 (1:35 in Rob’s case) I’ve still ever done on the bike. Re-reading this after nearly 5 years still makes want to vomit. Weirdly it also makes me want to do it again. I’d be curious to know what the hardest thing you guys/girls have done. Like misery, suffering loves company. Great memories Gerry. Thanks for calling. Talk to you soon.